Ring today to place YOUR booking! Balloon rides take off every day, where you can enjoy scenic views of Tamborine Mountain, Lamington National Park and the Gold Coast’s Scenic Rim from one of our hot air balloons! 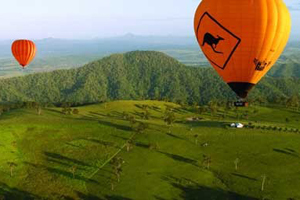 On your way to Tamborine Mt, come float in a hot air balloon it’s the ideal way to spend the morning and afterwards a delicious hot breakfast with champagne at O’Reilly’s Grand Homestead with time for wine tastings at Canungra Valley Vineyard. 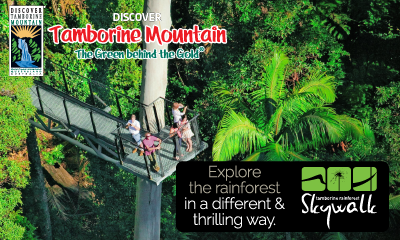 One of the best things to experience on the way to a visit to Tamborine Mountain is to float in a hot air balloon, seeing in the first dawn light from your wicker balloon basket. 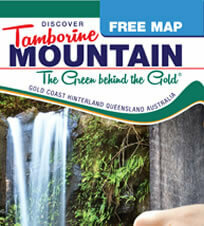 See Lamington National Park and on some days, the Gold Coast skyline sparkling to the west, it’s an amazing panorama that changes each season and each day.. So if you’ve always wanted to fly in a hot air balloon, do it here, as this is the best value balloon ride in Australia and experience the romance & wonder HERE, on the Scenic Rim. After a gentle landing, there’s a balloon cross country chase, balloon pack up games then afterwards, enjoy a delicious hot breakfast in the gracious ambiance of O’Reilly’s historic Grand Homestead with its high ceilings and wide relaxing verandas, with a full selection of hot & cold breakfast choices with a glass of crisp, cold sparkling wine. Sit back and enjoy the views from the veranda, take time to take a stroll over the sweeping gardens by the picturesque creek or sample award-winning wines at the Canungra Valley Vineyard’s Cellar Door. Balloon flights take off every day for sunrise, on making your booking an exact meeting time and place is confirmed, approx 5.20am at Canungra, earlier in summer. 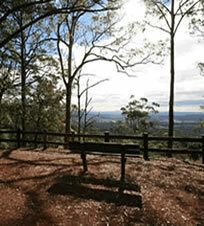 Your morning finishes at Canungra at 9.30-10am, ideal timing to drive up to Tamborine Mountain and stroll the shops, find a place for lunch and enjoy the beauty and tranquility of Tamborine Mountain. What a way to start the day!